I have not done much dyeing lately. My last dye day was on September 6th when I ran my second Japanese indigo vat. Since then, I managed to rinse and dry the skeins, but didn’t get much further than that. They’ve been sitting in a tub waiting for closure. On New Year’s Eve I finally wrapped up that loose end. As I noted in my original post, I don’t have good photo-documentation about that vat. But at least now I can show you photos of the skeins I dyed. All the yarns are wool. 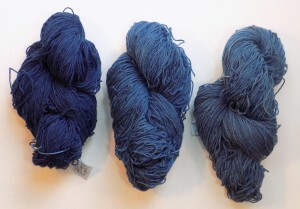 Here are the blue skeins.